Did you know there hasn’t been a professional women’s golf event in Arizona since 2002? Arizona lost the Tucson LPGA event a few years ago and the Phoenix event this year. Nothing has replaced them. How can that be? Arizona is like golf mecca for goodness sake! Where are the ladies??!! But thankfully, people like Mike Brown (AKA Sara Brown of Big Break Sandals’ dad) and Bruce Condon of the Cactus Tour decided to do something about it. 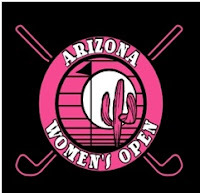 They formed a new tournament — the Arizona Women’s Open. Mike Brown: Well, why we are doing it now is very simple. There’s no place for women to play between the two stages of LPGA Q-School, for any sizable purse. There’s nothing. You go to first stage either in Arizona or Florida and get out, and then you’ve got this big break – no pun intended – where there’s just nothing. So I’ve been thinking about it, and I talked to Bruce Condon who’s been running the Cactus Tour up in Phoenix. We got together and decided to create the Arizona Women’s Open – a professional event between the 1st stage of the LPGA Q-School and the final stage LPGA Q-School; the timing is perfect. Golfgal: Are there other Opens out there for women that are good? Mike Brown: There are a couple of really good state Opens in the country that I’m aware of. Not that any of them are bad, but the Colorado Women’s Open is probably the best that I’ve seen. The Michigan Women’s Open is a very good one. Lori Atsedes (from Big Break Ka’anapali) runs the Florida Women’s Open. She does it the week before the first Duramed event in Florida. Golfgal: Where and when will The Arizona Women’s Open be held? Mike Brown: We chose the Red course at the Wigwam Resort in the West Valley, October 19-21, 2010. Golfgal: So who’s eligible to play in the event – just pros? Mike Brown: It’s a true Open with the professionals having priority up until the second or third week of September. But amateurs are invited; we’ll take anybody. The charity we’ve chosen for this event is the Juvenile Diabetes Research Foundation (JDRF). Golfgal: So what kind of response have you gotten so far — one, in terms of sponsorship, and, two, in terms of players signing up? Mike Brown: Well, it’s been interesting. Bruce is the Operations Guy and I’m the Mouth [Don’t you laugh at me! 😉 ] That time of year he has traditionally 20 to 30 Cactus Tour players that sign up anyway, and so he’s thinking nothing less on that. Our goal is to raise $50,000 so we can have a sizable purse that attracts the higher caliber players. The suppliers have said no. And it’s like, “Well, you know, the economy.” And I’m thinking, we have no women’s golf in Arizona! Our goal is only a $50,000 purse. Even in this economy, that is not a lot of money. I need ten people that can come up with $5,000. I already have one $5,000 contribution. Mike Brown: We’re just trying to get the word out to as many people as we can. I can get it out to the Duramed players; Bruce can get it out to all the Cactus Tour players. I’m talking to anybody that has anything to do with women’s golf. All sponsors will be listed on the Tournament and Cactus Tour websites with their company link. They will also be on FaceBook and Twitter pages. Well, there you have it. It’s good to see people like Mike and Bruce stepping up for Women’s Golf! Isn’t it your turn?